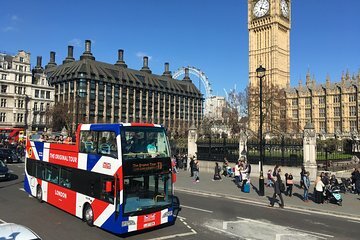 Check out London’s landmarks as you wish with this hop-on hop-off bus tour and Tower of London entrance ticket. With your 24-hour bus ticket, view sights such as St. Paul's Cathedral, Westminster Abbey, and more. Hop off at stops to explore the attractions on foot, and visit the Tower of London to discover its treasures, towers, and secrets. Your hop-on hop-off bus ticket also includes a Thames River cruise ticket and three London walking tours. Pretty good deal. Tower of London (which is just an entry ticket), then cruise on the Thames, also includes the HOHO Bus. Enjoyed that but takes a long time to complete a circuit due to the heavy traffic. But the earphones do fill you in on the sights around you. I highly recommend the HOP ON-HOP HOP OFF in any major city. You learn about the area, and it gives you ideas of places to go see you didn't know were even there. The T2 bus Christopher was awesome, insightful, and obviously in tune with his city. Excellent way to get around and see sites, I should have done the multi day package, which would have saved time on the other days trying to navigate the Underground/Tube. Good experience on our 2nd day in London to be able to see most of the sites within the city like St. Paul's Cathedral, Buckingham Palace, Picadilly Circus and even Oxford Street and Kensington Palace! Good way to go around in one day! You can take the 48 hour tour with just a slight upgrade cost since we only got the 24 hour tour. Good way to get around London and be able to go straight into the Tower of London.